See the termite mounds & waterfalls of Litchfield National Park. Discover the pristine waters, beaches, rainforest & the Great Barrier Reef from Airlie Beach. 3 night stay in Darwin at the DoubleTree by Hilton Esplanade Darwin including breakfast. Full day Litchfield National Park and Waterfalls tour. Transfer from your hotel to the cruise terminal. 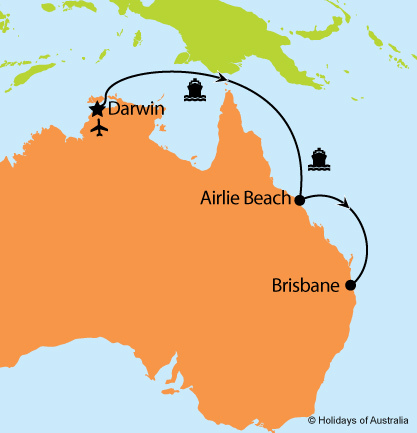 6 nights aboard Pacific Dawn cruising from Darwin to Brisbane with a port call in Airlie Beach. Your cruise includes on board meals and entertainment. Images courtesy of Tourism NT, Jules Ingall, Shaana McNaught, Peter Eve & P&O Cruises. *Departures from Hobart & Perth are subject to a supplement of $150 per person. ^Fly free offer valid on new bookings only for a limited time or until sold out and flight must be to your closest Australian capital city, subject to availability of selected flights on selected days for 1 flight only unless otherwise specified.